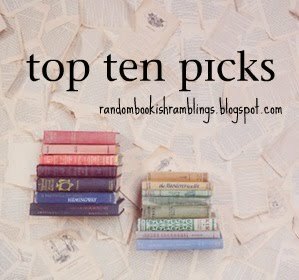 Top Ten Picks is hosted at Random Ramblings! 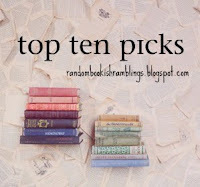 Check out this list of my Top 10 Favorite Book Series! Before I get started, I should say that I decided to split trilogies off into their own post, so look for that in the future. This list only contains series that have more than 3 books published! This one is no surprise to anyone that knows me: I have already featured Amelia Peabody as being one of my favorite book characters. These books take place in Egypt (the majority of the time), and feature mystery, humor and a cast of absolutely brilliant characters. Mixing historical fiction with mystery and romance is probably my favorite combination, and this series was one of the first and one of the best. I see Amelia’s influence in all my other favorite historical fiction series. There is a reason for that. Check out Crocodile in the Sandbank, the first book in the series! Sookie Stackhouse…the-dumb-blonde-that-isn’t-really-dumb-even-though-she-acts-like-it-who-lives-in-the-South-who-likes-to-have-romantic-relationships-with-supernatural-creatures-and-oh-yeah-she-reads-minds. This series is pure fun. I love reading about Sookie, and I love reading books that take place in the South. This series has one of the coolest paranormal worlds I think, and of course has a super successful TV show based on it. And oh yeah…the most important thing this series offers? ERIC. As much as I love my Sookie, I have to give this series the higher spot. Cat and Bones are electric, entertaining, exciting…all the good e words. I love them. LOVE THEM. I can’t get enough of ’em. I think I’ve re-read the four books out in the series (of a proposed seven) two or three times since I first read them about a year ago. Besides the awesomeness that is Cat/Bones, the fact that this series has one large story arc with a limited number of books makes it even more alluring. This one is different than all the other series that made the list. It is romantic suspense, most of the books feature Navy SEALS. It makes sense, right? Military men=heroes=hot. There are seventeen books published so far, and I have enjoyed all of them. Usually, you will get to know the characters well before they are featured as the MC. I like that a lot, it makes all the relationships seem so much more developed when they have more than one book to form. Another great feature of this series is that it features some homosexual characters. Another historical/mystery/romance combination. Lady Julia is another awesome heroine, I love reading about her. I have featured her as a favorite character and reviewed the fourth book of the series, Dark Road to Darjeeling. One of these days I’ll probably be featuring the other MC, Nicholas Brisbane. He is smoking, definitely high up the literary crush list. I love everything about him! No book involving him and Julia could ever be boring, and when you add in awesome mystery plots…you have one awesome series. I always look forward to the next one being published! This series is a lot like the Lady Julia series plot wise, but with a much different tone. I rate it higher for one big reason: Colin Hargreaves. Colin might even have the honor of being my numero uno literary crush, I practically drool every time I re-read these books. I definitely wish I’d discovered the series when more books were published, because I’m always dying for the next one! As I’ve mentioned already on the blog, the 5th one is coming out in October. The majority of books I read are young adult, so it is hilarious that this is the first YA series to make the list. But kiddie lit will definitely be making a comeback on the trilogy list, so no worries. I am obsessively involved with this series, seriously. Rose and Dimitri are one of the best written romantic couples I’ve ever read, the chemistry Mead created between them has already overcome a ton of ridiculous obstacles, and if they don’t end up together I’ll probably have to jump off a cliff. The last book, The Last Sacrifice, comes out in December…and you better believe I will be pre-ordering a copy and reading it the instant I receive it. The last (and the best) of all the historical/mystery/romance series I read. I have absolutely adored every book of the series, and one of the best things is the modern-day subplot that runs through all of them. Mixed throughout the historical part of every book are 4-5 chapters chronicling the life of a modern-day grad student. When I get a new book, I always cheat and read her parts of the book before going back to read the rest. I highly highly recommend reading these, they are absolutely brilliant, I really can’t rave about them enough. I have reviewed the most recent book, a Christmas novella, here on the blog. This is the only old long-finished series to make the list. Anne is a treasure, one of the best characters ever created. These books are what made me love reading, and Anne also gives you a new appreciation and outlook and ability to love life in general. The way she looks at things and imagines the things she doesn’t see…such gorgeous writing and beautiful stories, I worship L.M. Montgomery for creating her. I have featured Anne and Gilbert both on the blog already, and will most likely rave about them again in the future. No contest. These books represent everything I love about books, about life, people and learning and the world. Enough said. SO much awesome is up there, my head is going to explode! I love HP and VA series too. I'm jumping with you right there and then if Rose and Dimitri don't end up together in the last book. Seriously. My heart will just break because it's not fair after waiting for them to be finally together, and it's the LAST book.